The moisture adsorption rate of silica gel type E is generally 20 - 25% by weight at 40% RH. 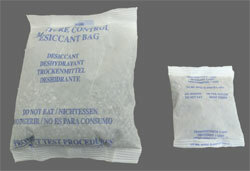 Silica gel can be re-generated many times at temperatures between 130° and 150°C. Fan ovens are ideal for this purpose. We have chosen some of the most interesting styles for you, special styles are available on request. Silica gel M has a much higher adsorption capacity than silica gel type E. However, the adsorption of water mainly takes place in the wet region, between 80 - 100 % RH. Non-indicating: spherical beads, white, glassy. Apparent density ap. 750 g/l. The globular shape of the beads allows the air to pass more easily. Beads are therefore most appropriate if silica gel is to be used in thick layers. Internal surface area: 800 m²/g. Ideal for drying flowers. Granular size: 0,2 - 1,0 mm, amorphous. White, glassy. Apparent density: >= 670 g/l. Granular size: 2 - 5 mm, round beads . This product is replacing the indicating "blue gel" currently presumed to cause cancer. Depending on its moisture content, silica gel neoblue changes its colour from blue to red. Silica gel neoblue can be blended with non indicating silica gel, e.g. at a weight ratio of for example 1:10. Regeneration temperature should not exceed 140°C in order not to damage the indicator. The colour shift from blue to red occurs between 15 - 45% RH. So the colour shift is giving you a good idea about the remaining capacity of the silica gel. For special applications we still offer cobalt containing blue gel (in stock: 2 - 5 mm or 4 - 8 mm). Prices upon request. Indicating silica gel, spherical beads. This product is replacing the indicating "blue gel" currently presumed to cause cancer. Depending on its moisture content, orange silica gel changes its colour from orange to colourless. Orange silica gel can be blended with non indicating silica gel, e.g. at a weight ratio of 1:5. Regeneration temperature should not exceed 140°C in order not to damage the indicator (phenolphtaleine). The colour change from orange to translucent occurs at 5 - 9% RH, so it's not indicating saturation of the silica gel. There is a lot of adsorption capacity remaining after the colour change has taken place. 6 - 10 mm Silica gel M (macro-porous) has a much higher adsorption capacity than silica gel type E. However, the adsorption of water mainly takes place in the wet region, between 80 - 100 % RH. Therefore it only can be used in special circumstances, mainly to prevent condensation of water. Adsorption capacity >70 weight % at 100 % RH. Compared to ordinary silica gel type M this "waterproof"
style doesn't break if liquid water is poured on it (water resistance > 90 %). Bags of natural clay (bentonite) in non-woven bags, dust-proof according to DIN 55473, Bentonite is a non-poisonous natural mineral. DESI PAK bags are approved for packing of food and pharmaceutics (also FDA-approved). Bentonite can be used for drying up to 50°C. For transports to tropical regions silica gel should be preferred. The vapor uptake of bentonite is similar to silica gel up to an equilibrium moisture content of 40% RH. Above 40% RH, silica gel performs better than bentonite. The necessary amount of desiccant bags can be calculated if you use a vapour barrier foil with known characteristics and if all edges are well sealed: For HDPE 0,2 mm, you should calculate with a vapour permeation of 0,4 g/m²/day for moderate climate and of 2,0 g/m²/day for tropical climates. For aluminium barrier film you can calculate with 0,1 g/m²/day regardless the climate. If your object is too wet when packed you have to add extra bags. The bags 6 g, 12g and 16 g can be re-generated many times at 110°C, in any conventional household oven at 110°C, for 2 - 4 h. Fan ovens are ideal for this purpose. To check if your bags still release vapour place a hot bag an a cold mirror or cold shiny metal plate. If the bag still releases vapour there will be dew on the mirror immediately. Once the bags are cold you also can check with the humidity indicator strip 8% RH delivered along with the bags. Bags of natural clay (bentonite) in non-woven bags, dust-proof according to DIN 55473, can be re-generated many times at 110°C. Bentonite is a non-poisonous natural mineral. DESI PAK bags are approved for packing of food and pharmaceutics (also FDA-approved). The necessary amount of desiccant bags can be calculated if you use a vapour barrier foil with known characteristics and if all edges are well sealed: For HDPE 0,2 mm, you should calculate with a vapour permeation of 0,4 g/m²/day for moderate climate and of 2,0 g/m²/day for tropical climates. For aluminium barrier film you can calculate with 0,1 g/m²/day regardless the climate. If your object is too wet when packed you have to add extra bags. Re-generation can be done in any conventional household oven at 110°C, for 2 - 4 h. Fan ovens are ideal for this purpose. To check if your bags still release vapour place a hot bag an a cold mirror or cold shiny metal plate. If the bag still releases vapour there will be dew on the mirror immediately. Once the bags are cold you also can check with the humidity indicator strip 8% RH delivered along with the bags. Prices for larger quantities upon request. For these bags you can use self-adhesive humidity indicator strips 40% RH. The non-woven bags have good dust retention, but they are not dustproof according to DIN. The TYVEK-bags are dustproof - excellent quality at a low price, for example for packaging electronic components! Weight indications refer to the gross weight. Adsorption capacity: >= 11% at 20% RH, >= 22% at 40% RH, >= 33% at 80% RH. The paper bags can be re-generated at 130°C, the TYVEK bags at 110°C. The non-woven bags are intended for single use, since the bag material doesn't withstand regeneration temperature . Dust proof GDT-bags filled with silica gel, dust proof according to DIN 55473, tearproof. Highest quality for optimum protection: e.g. packing of electronical or optical equipment. Approved also for food and pharmaceuticals (also FDA approved). Weight indications refer to the net weight. These bags can be re-generated at <110°C. Desiccant based on calcium chloride. One bag 125 g is able to absorb up to 200 g water. The top side of the sachet is permeable to water vapour. But no liquid is seeping out regardless the position of the bag. A thickening agent (attapulgit) is absorbing all liquid. The bags can not be re-generated. They can be disposed off after use as ordinary waste. For one 20'-container you need about 40 - 60 bags. artificial zeolith Molecular sieves are used when an object has to be conserved in an extremely dry atmosphere, at a RH around 0% RH. They can absorb around 20% of water regardless the relative humidity. So they maintain RH close to 0% until they are saturated. Regeneration temperature: 250° - 300°C. Molecular sieves can be delivered packed into custom made dustproof TYVEK-bags. Supplement per bag: € 2,-, regardless the size of the bag and the weight. Prices for quantities >100 upon request. The bag material does not withstand the re-generation temperature (so you have to open the bags and re-pack later, with a sealing instrument). Standard sachets with molecular sieves 3Å see below. Water adsorption >18 weight % between 0 - 10% RH and >21 weight % at 50% RH. Packed in aluminium bags or metal cans.